Repairs will get underway Saturday night on I-15 in the Cajon Pass after a 200-foot portion of the southbound freeway collapsed Friday. During the repair process, southbound traffic will be reduced to one lane from SR-138 to Cleghorn Rd. 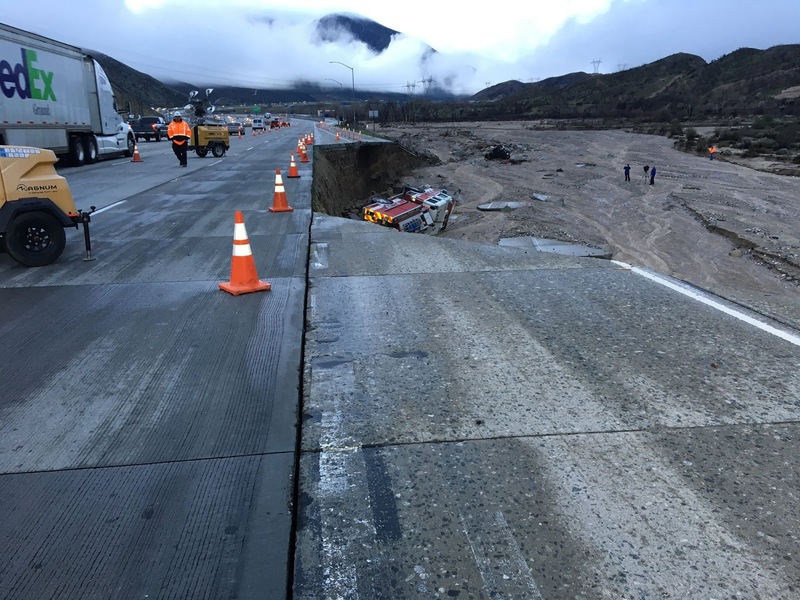 UPDATE 0930 hrswitter citizen reporting a dam access road has collapsed. 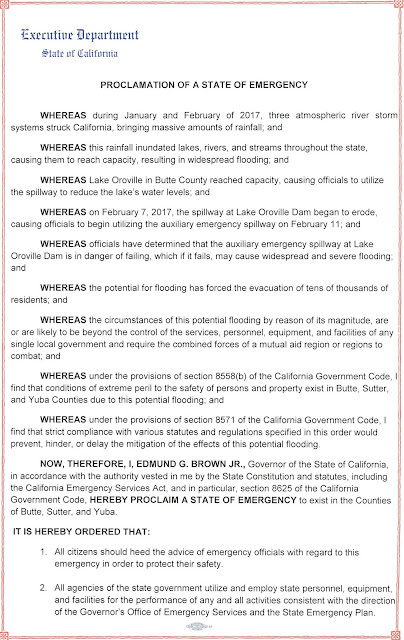 SACRAMENTO – Governor Edmund G. Brown Jr. issued an emergency order tonight to bolster the state’s response to the situation at the Oroville Dam’s auxiliary spillway and support subsequent local evacuations. “I’ve been in close contact with emergency personnel managing the situation in Oroville throughout the weekend and it’s clear the circumstances are complex and rapidly changing,” I want to thank local and state law enforcement for leading evacuation efforts and doing their part to keep residents safe. 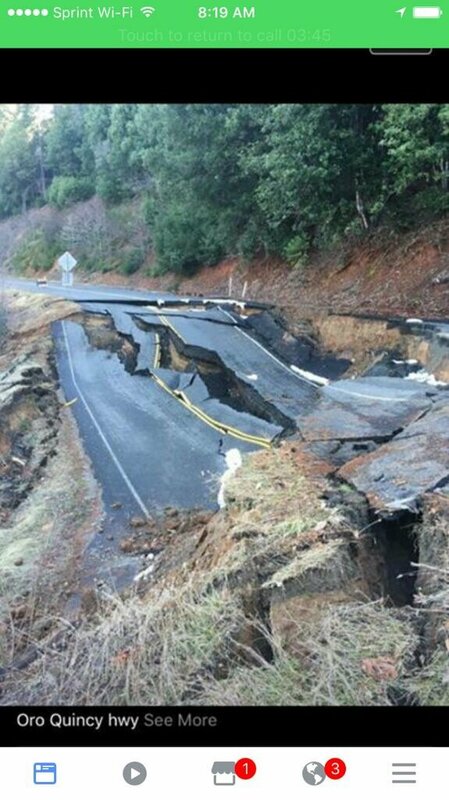 The state is directing all necessary personnel and resources to deal with this very serious situation.” - said Governor Brown. The Governor’s Office of Emergency Services has activated the State Operations Center in Mather, California to its highest level and is coordinating with personnel at the Incident Command Post in Oroville, California and with other local, state and federal emergency response officials to address all emergency management, evacuation and mutual aid needs. The Governor’s Office of Emergency Services will host a media availability from the State Operations Center at approximately 11:00 p.m. tonight with officials from the California Highway Patrol, California National Guard, California Department of Water Resources and California Department of Forestry and Fire Protection (CAL FIRE). 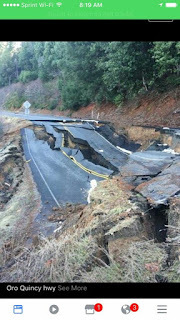 Follow live at: http://www.caloes.ca.gov/live. 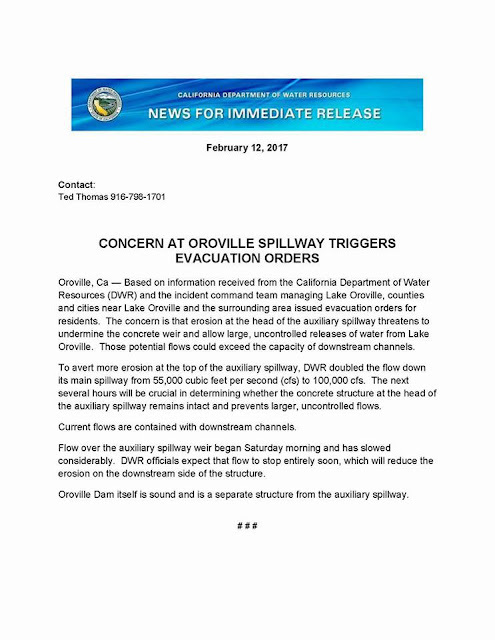 UPDATED EMERGENCY ALERT #OROVILLESPILLWAY at #OROVILLEDAM, Imminent danger of collapse / Evacuations are in progress. EMERGENCY ALERT #OROVILLESPILLWAY at the #OROVILLEDAM, Butte County, CA is in imminent danger of collapse and evacuations are in progress. Tens of thousands of people have been fleeing California towns downstream from the Oroville Dam after fears of an imminent collapse of its spillway prompted an evacuation order. Authorities are seeking to stem the breach with the help of helicopters. Earlier today, the California Governor’s Office of Emergency Services activated the State Operations Center in Sacramento in support of the Oroville Dam auxiliary spillway incident. The California Department of Water Resources (DWR) and the incident command team managing Lake Oroville, counties and cities near Lake Oroville and the surrounding area issued evacuation orders for residents late Sunday afternoon. 02/14/17 13:00: EVACUATIONS DOWNGRADED FROM MANDATORY TO ADVISORY - Water is flowing at 100,000 cfps and will continue for foreseeable future or until pressure is sufficiently reduced on the auxillary spillway. 02/13/17 13:00: Water is being released at approximately 100,000 cfs. As you can see, lake level is now around 6 feet below the top of the Emergency spillway.The evacuation of residents in Oroville and surrounding communities in the shadow of the nation’s tallest dam was issued around 4:30 p.m., with California Department of Water Resources officials saying floodwaters could arrive within the hour. 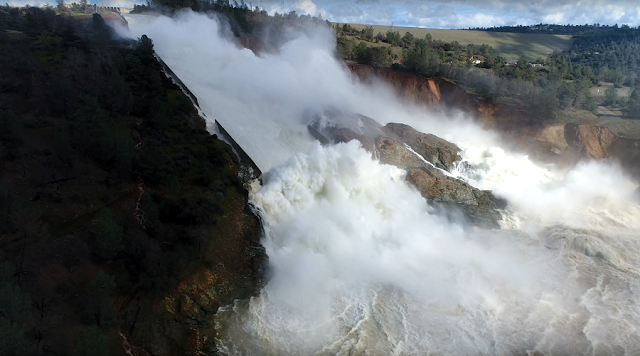 By 8 p.m., the crisis had eased, as the water level of Lake Oroville, the state’s second-largest reservoir, had fallen to the point — roughly 900 feet — that no water was passing over the imperiled auxiliary spillway. 02/12/17 22:00: Flows over the auxiliary spillway have ceased. 100,000 cfs continue down the main spillway. Prepare your bug-out bag, children, and pets now if waiting for further instructions downstream. Shelters in Paradise consolidated. Elks Lodge and Veterans Memorial Hall now CLOSED. Paradise Alliance Church, 6491 Clark Rd. is OPEN. Tim Taylor has called closure of all schools tomorrow except Chico Unified and Paradise Unified. 02/12/17 16:20: This is an Evacuation Order. 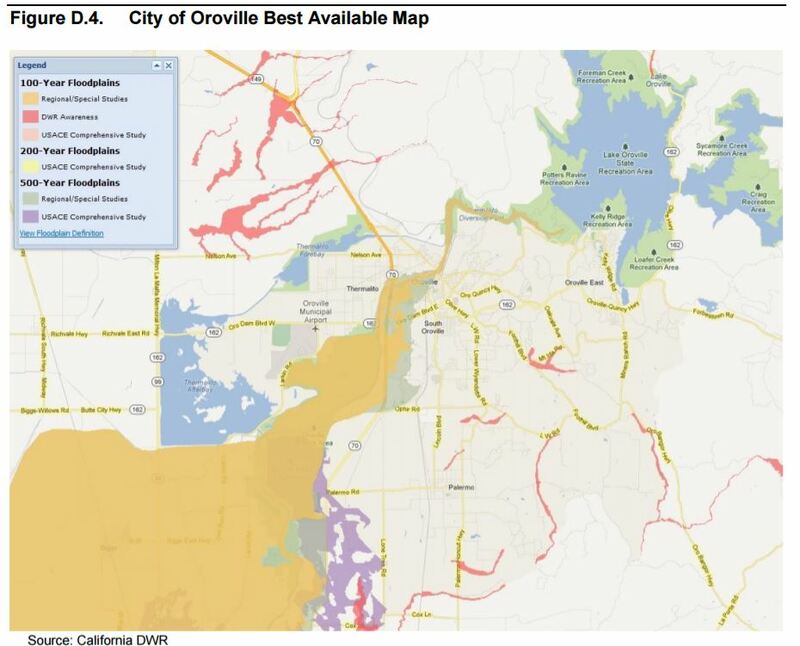 Immediate evacuation from the low levels of Oroville and areas downstream is ordered. A hazardous situation is developing with the Oroville Dam auxiliary spillway. Operation of the auxiliary spillway has lead to severe erosion that could lead to a failure of the structure. 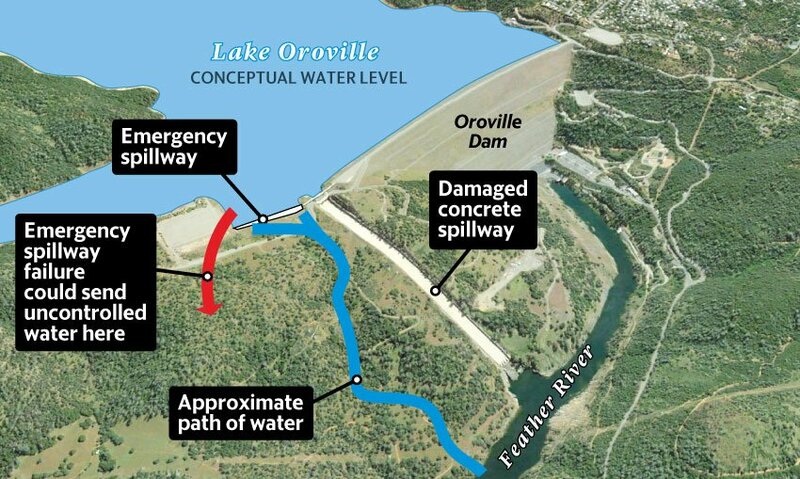 Failure of the auxiliary spillway structure will result in an uncontrolled release of flood waters from Lake Oroville. In response to this developing situation, DWR is increasing water releases to 100,000 cubic feet per second. This in NOT A Drill. This in NOT A Drill. This in NOT A Drill. 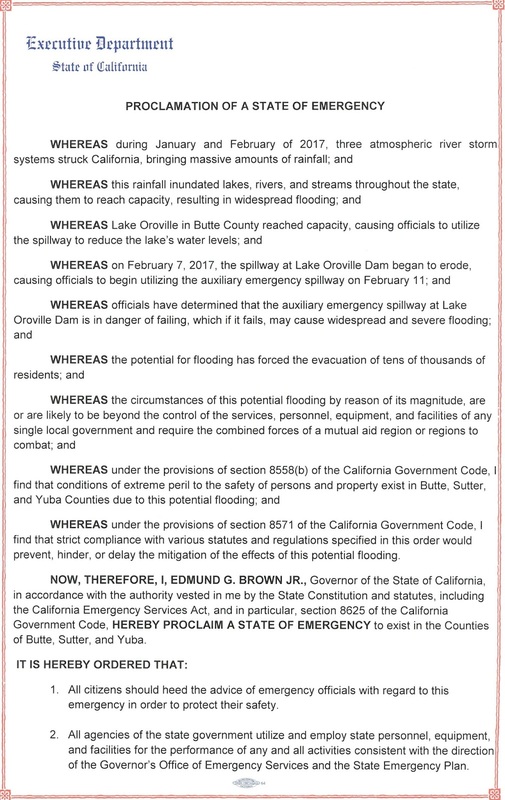 #OrovilleSpillway evacuation orders issued in Butte, Yuba, Sutter counties; no significant impact expected in Yolo, Sacramento, Placer. Nevada County Fairgrounds is open as an evacuation shelter. Accepting animals and RVs. The Public Information Line for the Oroville Spillway is currently down while call takers evacuate. Line will be back up shortly. Firefighter-2 Sara Thomas. 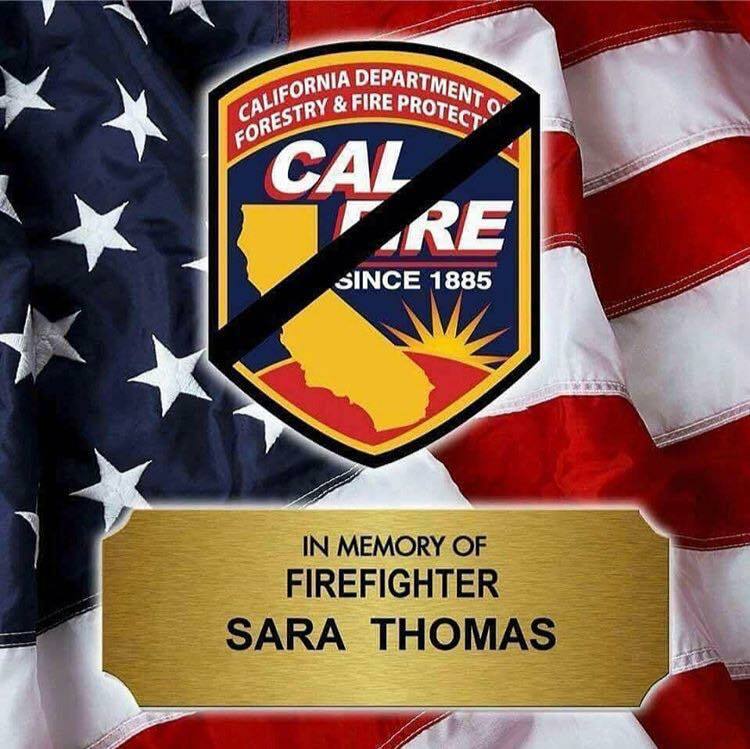 Firefighter Thomas served the citizens of California for 15 proud years. Recently at Station 80, Battalion 7. Indio/RVC/CALFIRE. She passed from stage 4 cancer at her home with her twin 7 year old daughters.